The last and all time favourite of the Crave Sydney International Food Festival was the Night Noodle Markets. The Night Noodles market occurred October 3-5, 8-12, 15-19, 2012. The event involves Hyde park coming alive with crowds of people enjoying food (most Asian inspired) and a great night outdoors. The Night Noodle Markets is supposed to provide the feel of an Asian food stall market, where each stand provides something new and different for you to try. 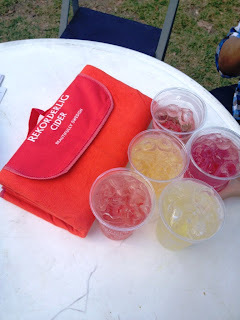 My highlight of the event was the Rekorderlig Cider Stand/Garden. I have been to the Night Noodle Market 3 years in a row, and the Rekorderlig Garden was a fantastic new introduction to the event. The Rekorderlig garden was aimed to create a chilled, relaxed and comfortable environment where people could enjoy food and drinks. There was great music, and Rekorderlig branded bean bags, along with Rekorderlig picnic blankets for those who bought 4+ ciders in one transaction. The garden allowed for an upbeat atmosphere to enjoy the Night Noodle Markets. For those who aren't sure what Rekorderlig Cider is, it is a Swedish Cider that was established in the late 90s. It is becoming one of the more popular beverages of choice, where flavours include, winter fruits, strawberry & lime, apple, pear and strawberry & mango. Exciting news of a new flavour of orange & ginger will soon be available. Rekorderlig will be continuing there garden at the Taste of Melbourne Festival, and Margaret River Gourmet Escape. I hope Rekorderlig will be at next years Night Noodle Market. All the food was delicious. When you go to Night Noodle Market with a bunch of friends you can all buy different things and try each others food, which makes the event even better. Looking forward to next years Night Noodle Market. Do you remember what the store with the glutinous rice balls was called? love their use of real fruit inside!